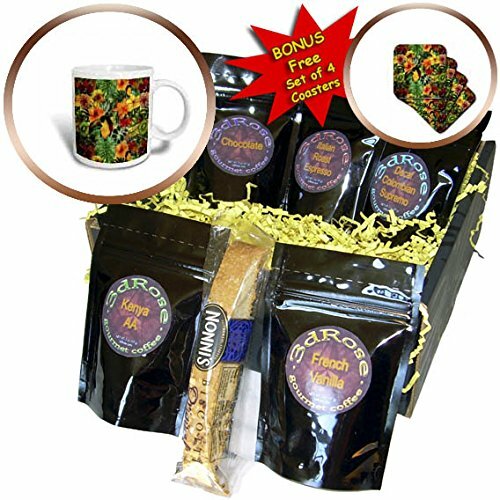 Aloha Tropical Bird Fruits and Hibiscus Palm Jungle Hawaii Pattern Coffee Gift Basket is great for any occasion. This elegantly presented gift box comes with a 15oz mug, a biscotti cookie, 5 blends of gourmet coffee and includes a BONUS set of 4 soft coasters. Coffee selection includes French Vanilla, Kenya AA, Decaf Colombian Supremo, Chocolate and Italian Roast Espresso, sure to please a variety of coffee connoisseurs. All packaged in our signature 9" x 9" x 4" black box.